Awarding Baseball certificates is a traditional way to reward the baseball players. In order to make it more advanced and digital, you can add the photograph of the recipient. Adding a photograph makes your certificate unique and attractive. When you award baseball certificate to your player, you make him feel valued and acknowledged. What are the key elements of baseball certificate? According to the needs and demands of your institute, you can add some more details in this certificate. Similarly, the details that are least required can be deleted from the certificate. In other words, this certificate template provides the flexibility to the user with which he can omit the details in it. 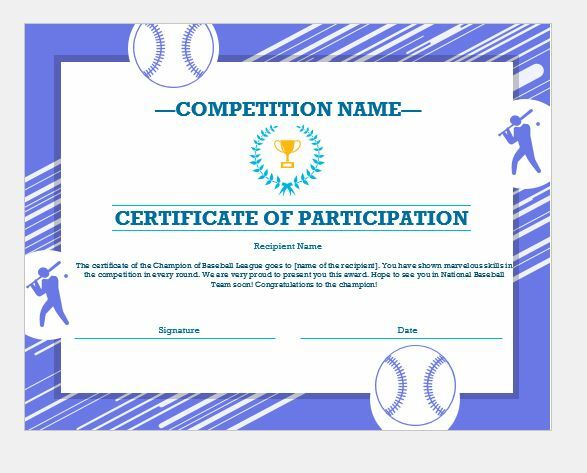 If you have organized a baseball event in your institute and you want to give a certificate to every player in the tournament who has participated in the game, the baseball certificate template is for you. The purpose of awarding baseball certificate is to make everyone realize that they are an asset to your institute no matter they win or lose. It should be noted that this certificate is not only for winning team. The players losing team should also be given this certificate to motivate them. However, the reason for awarding the losing team players is to encourage while the winning team is to appreciate good performance. Regardless of the performance, every baseball player might have put serious efforts into winning the tournament. It is their right that they should be acknowledged by you. For this, baseball certificate can serve the purpose. The baseball certificate is granted to [name of the recipient] in acknowledgment of outstanding righteousness & sportsman spirit while partaking in baseball competition held at [name of the school]. This certificate speaks of his\her extraordinary performance & wants him\her never to put a brake or full stop in making progress in this filed. Congratulations! This certificate of appreciation is given to you in recognition of the time & energies you volunteered in the Baseball League held at our institute. Bundle of thanks to the future of the state like you, the new generation of our country can become a better & useful citizen through the utmost support of the youth. Keep up the good work! 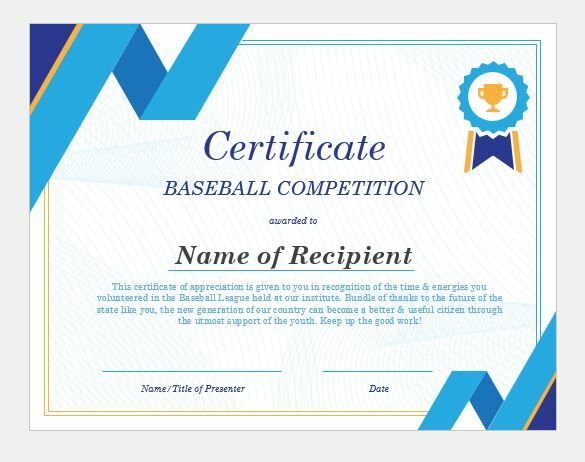 The certificate of the Champion of Baseball League goes to [name of the recipient]. You have shown marvelous skills in the competition in every round. We are very proud to present you this award. Hope to see you in National Baseball Team soon! Congratulations to the champion!